British company Haven holidays, that owns and operates dozens of family holiday parks and provides caravan, touring and camping facilities across Britain in predominantly coastal locations, advertises its services in an advert featuring two little girls. 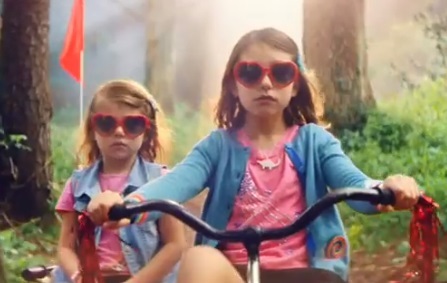 The 30-second spot follows two little sisters dressed in similar colorful outfits and sporting pink-heart-shaped sunglasses, returning from a forest to the holiday park they have accommodation in. On their way back, they watch around them and see how others have fun there: some kids are zip-lining high up in the trees, others are having fun in the pool, others are spending their time on the beach looking for lobsters, and others are buying ice cream from a kiosk situated near the amusement park. The advert, scored by Portugal.The Man’s hit single “Feel It Still”, also informs, through onscreen lines, that facilities vary by park, that height and age restrictions apply for those willing to rope slide, and that dogs are welcome at most parks (but conditions apply). The spot concludes with the voiceover saying “Forget your ways, longer stays or your very own place” and encouraging viewers to find the company’s best offers on its website. Finally, the company’s tagline, “A breath of fresh air,” is added. “Feel It Still” was also featured in ads for the Apple iPad Pro, YouTube TV, Vitamin Water, and in the first two trailers for the 2018 film “Peter Rabbit”.